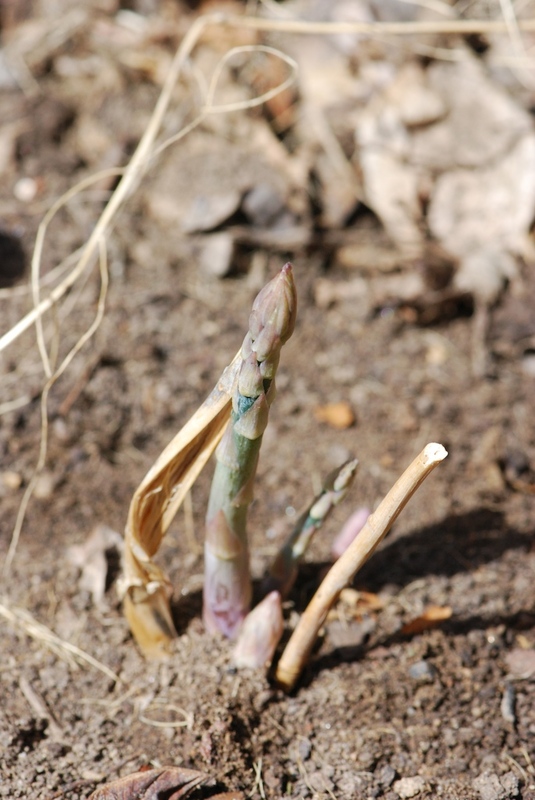 I was just looking at the garden and trying to decide when to clean it up and start planting, and lo and behold; last year’s asparagus is coming up nicely – woo hoo! A quick peek under the hoop house and I see the lettuces and Mizuna I planted last fall are sprouting – I’ll start harvesting asparagus next week (if it doesn’t freeze), and lettuces in 2-3 weeks! Even though it’s chilly outside and the nights are still freezing, it’s warm and toasty inside my homemade hoop house. It’s a great way to extend the growing season and for larger tomato and eggplant seedlings. Find a basic video guide here – and learn more on Dig In Colorado this season, a local gardening show I teach cooking on. We’re started filming the 2011 Dig In Colorado gardening show series for Fox 31 – look for it every Saturday morning on FOX 31 at 6:30 am. Last year’s first video featured asparagus – enjoy, I hope it gets you in the mood for gardening and the spring asparagus! Adjust rack to top of oven and preheat to 425°. Break tough ends off asparagus (peel ends if desired) and place in boiling salted water just until crisp/tender and color deepens, about 1-3 minutes depending on asparagus. Remove and immediately shock-chill in ice water – do not overcook! Season plain breadcrumbs or proceed with Tony’s Parmesan Panko Breadcrumbs. Toss breadcrumbs as you slowly drizzle in about 1 TBS olive oil. Mix well to moisten crumbs evenly and set aside. Mist or brush a parchment lined baking sheet lightly with olive oil. Divide blanched asparagus into about 6 bundles. Lay out a slice of Prosciutto and gently use it to wrap a bundle of asparagus. Place on prepared sheet pan and gently flatten each bundle slightly (so it will hold more breadcrumbs). Repeat with remaining bundles. Variations: Add thin slices of fresh portobello mushroom and roasted red pepper tossed in olive oil to the asparagus bundles. Shell and devein the shrimp. Soften several rosettes of Tony’s Scampi or Herb Butter to room temperature. Thread shrimp on skewers in a C shape – do not crowd shrimp together. Preheat a medium to medium-high grill and clean the cooking grate well. Start boiling salted water for pasta, sliver basil and split tomatoes. Boil pasta until just done, drain and reserve some of the cooking water. Meanwhile, drizzle a large skillet with olive oil, add garlic and saute slowly until fragrant and lightly colored. Add cooked pasta and tomatoes and toss with pinches of crushed red pepper (if using), cooking for several minutes to marry. Add splashes of pasta cooking water to refresh pasta as needed. Add 1 rosette (about 1 TBS – or more to taste) of compound butter, remove from heat and toss to melt. Place pasta on a serving plate and sprinkle with fresh basil to taste. Soften butter to room temperature. Simmer vermouth, shallots and garlic, reducing to 1 TBS and cool. Blend all the ingredients into the butter – adjusting as desired. Get the blue cheese stuffed lamb chops recipe here.